Chihaya Ayase listens to Kanade Oe’s lecture. 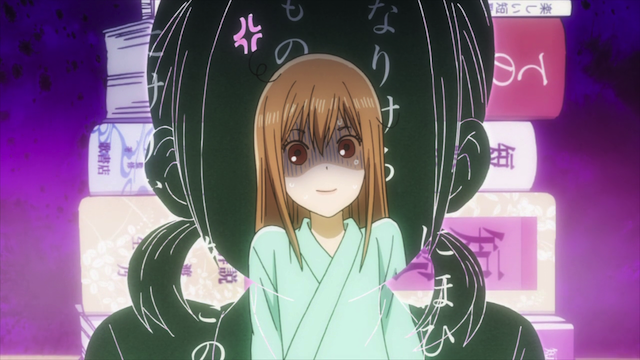 And thus season 2 of Chihayafuru comes to a close. This episode went very differently than I had anticipated. There little time was spent on reflections upon Mizusawa’s victories. Instead a lot of time was devoted to Chihaya’s injury, which turns out to be a serious condition requiring an operation and hospitalization. There was also some unexpected romantic development. In perhaps the most surprising development, however, Chihaya and Taichi get invited to the Fujisaki training camp by Coach Sakarazawa. There is no doubt in my mind that the producers want to deliver a third season. They left things just as Taichi and Chihaya were about to enter the Fujisaki training camp. It is like saying, “the story doesn’t end here!” I was desperate, at the end of the first season, for a second season announcement, and couldn’t believe my good fortune when it came. Am I pushing my luck to ask for a third season now? Chihaya in hospital gown and hand cast. Chihaya Ayase in tears at the end of the B-kyu Individual tournament. 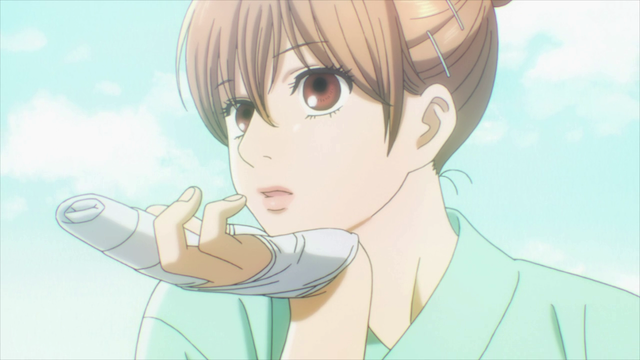 Episode 23 of Chihayafuru season 2 splits the attention between two very important games. In the A-kyu tournament, two of the most important people in the world of Karuta are facing off for the title. In the B-kyu tournament, Taichi is ready to face down his final opponent … until Chihaya appears ring-side. 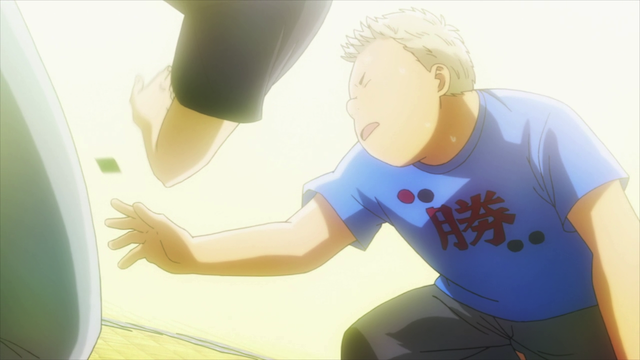 Taichi instantly loses his cool, and struggles to end the match early, because he wants to release Chihaya. Taichi’s desire is to support Chihaya, and let her watch the game transpring between Arata Wataya and the the Queen, Shinobu Wakamiya. His good intentions cause him to play recklessly, however, and then he loses confidence in his own ability to win against an opponent that Chihaya barely beat a few episodes back. 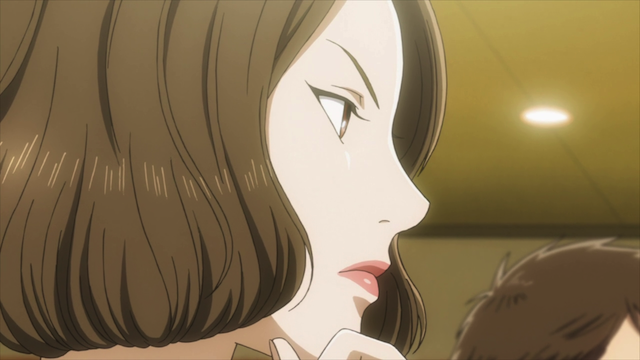 The episode had interesting perspectives on Karuta strategy (in both Shinobu and Taichi’s case, a decision was made to focus on winning certain cards, instead of over-committing in the face of a powerful opponent). There was also a surprising insight into the world behind the scenes, as Kanade Oe realizes that the reader for the B-kyu tournament is being graded for a position as a certified reader. 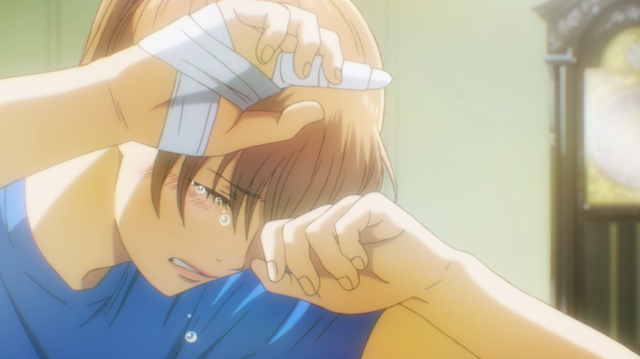 Nevertheless, in true Chihayafuru style, the story comes back to the human and emotional elements in the end. Chihaya and Taichi’s relationship in this episode is a little like the story of the Gift of the Magi by O. Henry. Chihaya wants to be there to support Taichi in his bid for A class ranking, and Taichi wants to support Chihaya by getting her out of there and back to the battle between Shinobu and Arata. Each of their gifts diminish the meaning behind the gift the other person gives. We only have a couple of episodes left. I’m going to be so sorry when this show is over! Chihaya Ayase refuses to back down. 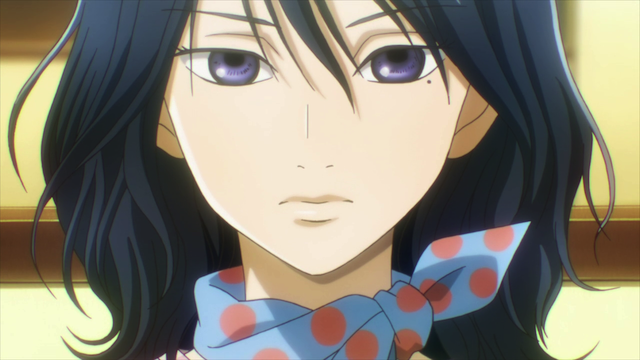 Episode 17 of season 2 of Chihayafuru officially begins the final match of the National High School Karuta tournament. Mizusawa is playing a team of all A-class players, except for Rion Yamashiro, Chihaya’s opponent. 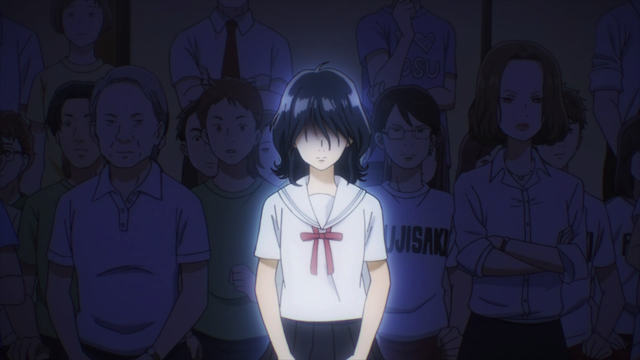 This episode covered quite a number of interesting things: there was backstory on Rion, information about team Fujisaki’s training under coach Sakurazawa, a lot about how the reader of the poems affects the play by those on the tatami, Chihaya’s injury (! ), Mizusawa’s resolve, and queen Shinobu’s curiosity is finally piqued. I won’t bother going into all the little details, even though many of the little details are quite interesting. 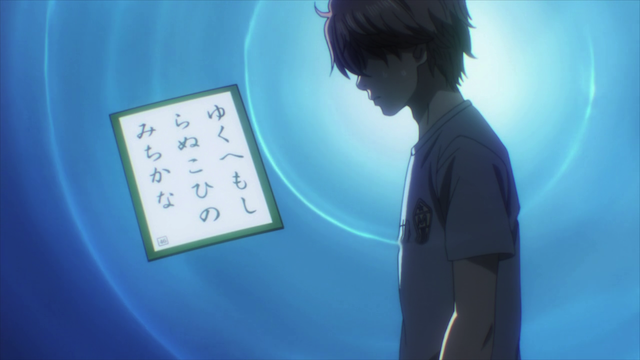 This was another episode of Chihayafuru in which I really felt the strength of this show is the way it develops multiple simultaneous stories. There are some who believe that the show is better when it focusses on just a couple of characters, but I disagree. I like the way the main characters are a part of a larger world. Many other shows have main characters that nhabit a world of generic background characters, but I think the trials and triumphs of side characters like Yuusei “Niku-man” Nishida give this show depth. If it were merely about Chihaya trying to become number 1, it would be a simple variation on the shounen narrative. Instead the continued presence of side-character Kanade Oe as gradually developed a lore about the poems, and the readers, which was utilized to great effect in this episode. 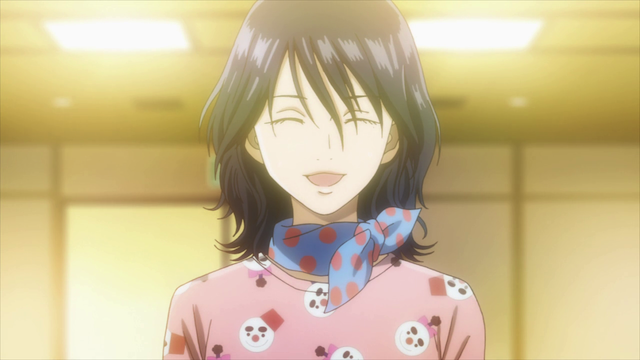 In terms of events, the two most significant were Chihaya’s injury and the ninja queen finally growing interested by the gameplay in the team tournament. I hope Chihaya’s injury doesn’t prevent her from playing in the individual tournament. 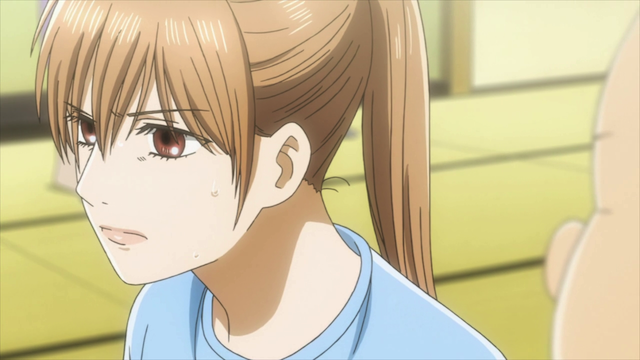 I think a team victory for Mizusawa would be sweet, but more than anything I want to see Chihaya play against Shinobu. Speaking of Shinobu, we have confirmation that she remembers Chihaya as a good player, so we can say that the build-up to their match is under way. I really want to see them go at it head to head. Coach Sakurazawa surveys the battlefield.